If you’ve been around the bodybuilding, weightlifting or fitness crowd for any length of time, no doubt you’ve heard the old adage that you ‘don’t grow muscles in the gym’. While your workouts are the catalyst for muscle growth, you build muscle during the recovery period. Your workout actually tears down your muscle cells, which spurs the body to repair and rebuild them bigger and stronger. In order to compensate for the damage done lifting weights, your body needs two main resources – nutrition with sufficient protein and carbohydrates and plenty of rest. Without enough of either the muscle-building process will be inhibited or even prevented from happening. Proper bodybuilding nutrition usually involves ingesting a greater number of overall calories than the average person eats in a day, with a higher percentage of those calories coming from protein and essential fats. Another important factor is the timing of those calories in order to make sure your body has the right ingredients available when it can best make use of them. When you hit the gym for a heavy weightlifting session you go through your exercises and reps creating micro-tears in the cells of each muscle you’re exercising and using up the energy contained within that muscle and your body in general (ATP & glucose). If the session is particularly intense or extended, you’re also releasing muscle-damaging cortisol into your system. Your body is a very sophisticated system designed to always return to homeostasis (a healthy, balanced state) and adapt to perceived upcoming conditions. As such it tries to start repairing that damage as soon as the excessive energy expenditure ends. A muscle cell can’t expend energy and absorb nutrients simultaneously, so the ATP replacement and tissue repair don’t start until you’re done. But the moment you finish your body starts the repair process and is looking for protein to repair the cells and carbohydrates to convert to glucose to feed the cells and create ATP from. While it will continue the healing, energizing and muscle building processes for two or three days (assuming it gets enough rest between workouts), the greatest demand for nutrients comes right at the start of your recovery and that is when the cells will take in the greatest amount of nutrients. Estimates of how long this optimal-uptake window lasts vary from expert to expert, but generally it’s believed to be somewhere between 45 minutes and 2 hours. So to take advantage of that window and get the best energy and muscle-building boost you need to get carbs and protein into your system immediately following your weightlifting session. We love the ease of ordering TrueStrength Whey Protein online and having it delivered right to our door every month! Further, you need to ensure that the TYPE of protein and carbohydrates you put into your post-workout shake are the fastest types for your body to assimilate. Ingesting dense complex carbs or slowly-absorbed proteins at this point will mean they don’t reach your bloodstream in time to give you that maximum uptake potential. At this point, stick to simple carbs and whey protein and get it into your system as quickly as you can post-workout. This is the single biggest nutritional intake benefit to your attempts to build muscle, so don’t ever skip it or delay drinking your post-workout shake. For best results, choose a top-quality protein powder that has sufficient sugars and mixes well just with water, and put one or two drinking bottles in your gym bag, each with a couple of scoops of the dry powder. Now when your weightlifting session finishes you can just add water, shake it up and drink it – before you even hit the showers! 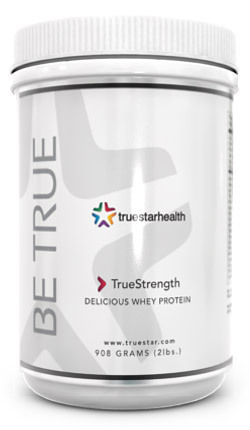 If you have trouble locating a good tasting, high-quality protein that mixes easily with water, you can order TrueStrength Whey Protein online from TruestarHealth – it’s our whey protein of choice and I can attest to the fact that it tastes great & mixes easily. Each scoop has 18 grams of protein, 10 grams of carbohydrates and 1 gram of fat, so it’s a perfect post-workout protein solution! If you want a greater protein hit, mix up the second post-workout shake after your shower and sip it as you get dressed and head out from the gym. While not all may make it into your system in time for the optimal uptake window, some will and the rest will be used during the remaining recovery. Most importantly, though, that first post-workout shake will already be hitting your stomach and starting the process to build bigger muscles and power up your day! Effective Nutrition – Are You Getting Enough Protein To Go With Your Workouts? Bodybuilding, Weightlifting And Powerlifting – What’s The Difference? This entry was posted in Building Muscles, Weightlifting, Working Out and tagged bodybuilding, bodybuilding nutrition, build muscles, post-workout shake, protein, protein shake, weightlifting, whey protein, working out. Bookmark the permalink. All of the muscles in your body are fashioned from protein, and thus it’s vital that you simply get enough additional protein in your diet to accommodate the muscle growth you’re attempting to realize. You’re mostly right, Steve – but the timing of that protein, the type of protein and the level of physical activity preceeding your protein intake matter as well. And don’t forget your carbohydrate/glucoe intake – your muscles will look ‘flat’ if there isn’t enough gluscose and water in the muscle sarcoplasm. Everyone wants to be in excellent physical shape. Someone wants to gain muscle mass and get stronger, some – lose fat, but they all want to have a healthy and beautiful body, which is a common feature of health of the whole organism. Great point, Lina – thanks for taking the time to point that out! While the pursuit of ‘the body beautiful’ is often driven by ego and esthetics, as we age it’s more often driven by the desire to be healthy, stronger and pain free and a desire for a longer, healthier life. Sometimes that involves adding lean mass to build bigger muscles, sometimes it’s to lose weight by burning fat, but usually the two go hand in hand in achieving your exercise goals. In all cases, though, knowing how our endocrine systems operate and using natural hormones like testosterone and human growth hormone (HGH) will make it easier to succeed without invasive surgeries or harmful drug use.